A 26-year-old man has been arrested after a 2-year-old child was killed in Baltimore back in January. 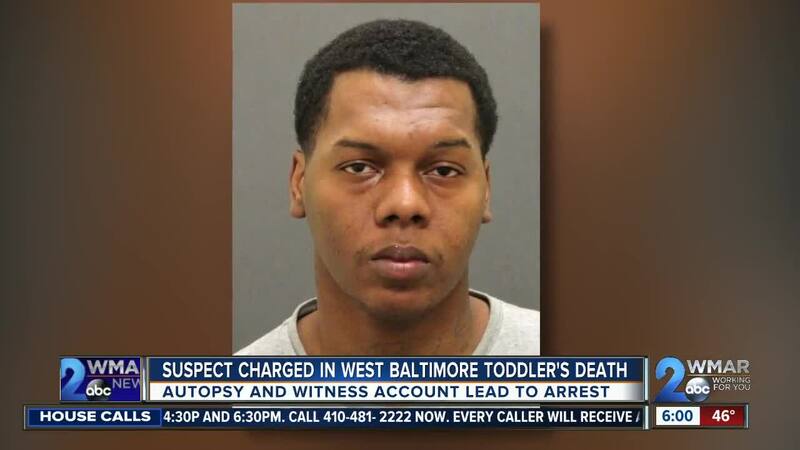 BALTIMORE — Six weeks after medics responded to an apartment on West Fayette Street where they found two-year-old Trevor Graham wasn't breathing, 26-year-old Jeremiah Amos faces a series of charges in connection with his death. According to charging documents, Trevor's mother had left him in the care of his sister and her fiance, but the sister then stepped out to run an errand after placing the toddler in the bathtub and asking Amos to watch him. 15 minutes later, Amos called her back to the house, because Trevor had stopped breathing, and he claims he immediately dialed 911 and began CPR on the child. Paramedics transported the two-year-old to a local hospital where doctors were able to resuscitate him, but he died an hour later. While Amos told detectives he stepped away to change another child's diaper and returned to the bathroom to find Trevor lying in the tub unresponsive, an autopsy determined the toddler had suffered a wide array of injuries to his body and head, including hemorrhages to his scalp and a lacerated liver. A witness claimed they saw Amos hitting and choking Trevor while he was in the tub, which confirmed for police that the same man who claimed he tried to save the boy's life is the one who caused his death. Amos now faces a series of charges including assault, second degree murder and first degree child abuse resulting in death.